The solution that unites Avaya Communication Manager with CRM applications. Providing customers with a unified desktop for smooth user experience & increased productivity. 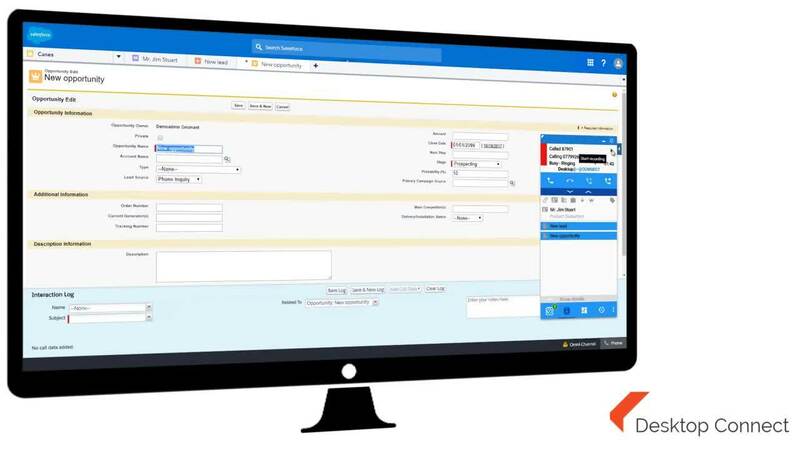 Desktop Connect extends the power and versatility of Microsoft Dynamics and Salesforce's Classic and new Lightning Experience by adding the telephony functions of Avaya Communication Manager (Avaya CM), as well as an intelligent screen-pop, softphone, click-to-dial capabilities, Avaya call recording and a unified agent desktop. Desktop Connect provides a seamless, ‘out-of-the-box’ solution that eradicates the need for reliance on the expensive professional services that are typically associated with integrations. You'll receive a state-of-the-art, omnichannel contact centre at just a fraction of the cost of a whole new solution. We’re that confident we can improve your customer satisfaction ratings with Desktop connect that we’ll give you the tools to prove it! We’ll also give you free use of our Buzzeasy Survey tool for up to 1,000 contacts. You can measure your NPS score before you start with us. Wait for a pre-agreed amount of time. Measure again to see first hand the value the solution brings. Geomant offers a fixed price cost based around an agreed scope which range depending on the complexity of project, typically, there are three componants which contribute to the overall cost of the solution. At Geomant we work with clients to understand the relative benefits of each deployment method and will assist in finding the most suitable arrangement to meet your customers commercial and operational requirements. A powerful tool that delivers contact centre functionality into your Skype for Business environment. The ultimate in contact centre digital signage & real-time performance management solutions,.. The complete IVR solution for Microsoft Skype for Business. Complete professional services for Avaya products: helping your customers to get the most out of.. In the academy are a wealth of Desktop Connect resources. answer any questions you might have. To see our solutions in action, arrange a demo.